Capitals Tour / Warsaw – Kazimierz – Sandomierz - Krakow /, Tour programs extra list - discover exciting Poland with us! Pearls of Northern Poland - tour of 2009 !!! During this tour we would like to introduce you to variety of Polish landscapes and regional cultures. Starting in Warsaw– the capital of Poland- through to Kazimierz Dolny, a picturesque town on the Vistula River and on to Sandomierz, a gem of Renaissance architecture , then Cracow the first capital of Poland - an ancient, magical city. Arrival in Warsaw, an evening stroll through the Old Town, welcome dinner in a regional restaurant, overnight stay at a hotel. Breakfast, guided tour of Warsaw: the Royal Castle, The Royal Route, the Old Market Square, the Barbican, Krakowskie Przedmieście, Łazienki with its splendid gardens and the Palace on the Water. Dinner in a restaurant, overnight stay at a hotel. Breakfast, transfer to Kazimierz Dolny, a picturesque old town on the River Vistula. Panoramic tour of the town with visit to the ruins of a castle, then to the old churches and monastery. Dinner and overnight stay at a hotel. Breakfast, transfer to Sandomierz, a fine example of Renaissance architecture The visit includes a walk through the streets of the Old Town,a visit to the castle and finishes at St. Jacob’s Church and Dominican Monastery. Dinner served in a local restaurant. Afternoon departure for Cracow, overnight stay at a hotel. Breakfast, guided tour of Cracow: the Main Market Square, St. Mary’ s Basilica and historical trade pavilions of the Cloth Hall, the Royal Route, Collegium Maius, Wawel hill with its renaissance Royal Castle and cathedral; a walk round the old Jewish Quarter- Kazimierz. Kazimierz is a place especially cherished by lovers of antiques. Dinner in a regional restaurant with live folk music, overnight stay at a hotel. Breakfast, transfer to Wieliczka - a visit to the famous Royal Salt Mine with numerous underground chambers, chapels and salt sculptures. Departure. The final price depends on standard of accommodation, number of visiting persons and date of your visit. A city resounding with life, young in heart, a mix of old and new, where historic huses face modern buildings and commercial centers. This verdant city, with abundant greenery of parks and gardens, was rebuilt after WWII. An important university center. The Old Town (historic center of the city) has been inscribed on the UNESCO’s list of world heritage. Mermaid – the emblem of Warsaw, featured on the city’s coat-ofarms Old Town Square, ul. Wybrzeże Kościuszkowskie. Old residence of the dukes of Mazovia and Polish kings, totally destroyed during WWII and meticulously rebuilt. A meeting point of young people and emblem of Warsaw. surrounded with tenement houses from the 15th to 18th century, rebuilt after destructions of WWII. the crypts with tombs and sarcophagae of prominent Poles are open to visitors. this imposing structure from the 16th century and the partly preserved ramparts marked the boundary of New and Old Town. Today it is hosting a summer gallery of paintings and performances by street musicians. A charming asymmetric square of varying level, with St. Casimir’s Church belonging to the convent of Holy Sacrament Sisters. A view tower and student ministry center. The opening street of so-called Royal Route. Two renowned Polish higher schools: Warsaw University and Academy of Fine I have moved the capital from Cracow to Warsaw and now in remembrance I have to stand on this column Sigismundus Column Since 14th I have defended the residents of Warsaw in appreciation of their hospitality. Arts are located at Krakowskie Przedmieście. The hearts of Chopin and Władysław Reymont, laureate of Nobel Prize in Literature, are entombed in the pillars of the left nave ul. Krakowskie Przedmieście 3. The venue of national celebrations, the Tomb of the Unknown Soldier from 1925, where urns with soil from the battlefields of Polish soldiers during WWII are entombed. Polish soldiers guard the tomb, located near the Saxon Garden from the 18th century and a new Metropolitan office building designed by Sir Norman Foster. A park of 76 hectares located in the center of the city, summer residence of the last king of Poland, is one of the most beautiful garden complexes in Europe. 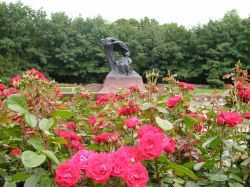 set in the rose garden, at a pond; throughout the summer Chopin piano recitals are performed at the foot of this famous Polish monument. Wilanów The gateway to Royal Route, is located 6 km apart from the center of the city. Sightseeing: the Palace – summer residence of King Jan III Sobieski, the defeaterof Turks near Vienna, and a vast park. Poster Museum in Wilanów with a collection of Polish posters since 1892.
with a gallery of ancient (frescos from Farras)and medieval art, Polish and European painting, Polish art of the 20th century and European decorative art. the most controversial building in Warsaw, erected in the 1950’ as a gift by the Soviet Union. Hosts several research and commercial establishments, museums, theatres and cinemas. A viewing platform on the 30th floor offers an expansive view over Warsaw and its surroundings. The Gallery of Art was founded in 1956. It is one of the finest collections in the world illustrating major achievements in painting, sculpture and decorative arts. Zachęta National Gallery of Art is the oldest exhibition site in Warsaw, with a tradition stretching back to the mid 19th Century. It is located in the heart of Warsaw, next to the Saski Park, and in the immediate vicinity of the University of Warsaw and the Academy of the Fine Arts. A flea market. Old furniture, paintings and icons, china and other gadgets are offered. New building of Warsaw University Library, with rooftop gardens and a splendid view over Vistula River. In the 14th century this became prosperous mercantile town, and during the period Jews began to settle in the area. Dynamic Jewish communities of tradesrs and shopkeepers were integral to the charakter of the town and today one of the traces is the former Lustig house which belonged to Jewish mercantile family. Other evidences of their presence are the synagogue, jewish cemetery, and the collection of ritual objects displayed in the Silverware Museum. A delightful town on the Wisła River, with over 120 historic buildings, some over 800 yearsold. Museum and galleries testify to vibrant cultural life. Guided tours of the cellars beneath the main square. Stunning ravines close to the old town. Sandomierz undoubtedly has always been a European city as itpreserved the various marks of the history of Europe and it belongs to its cultural heritage. Sandomierz a town whose roots reach back over ten centuries, is picturesquely situated on the edge of Kielecko - Sandomierska Upland, declining in theform of huge slopes into the Vistula valley. Formerly Sandomierz belonged to the biggest towns in Poland. As sedes regni principalis it used to be aduke’s seat and a royal residence. Bound up with Christianity for ten ages, together with a nearby Zawichost it was also a communication link of international trade route, leading from Western Europe through Wrocław, Cracow, Wiślica and Sandomierz to Rus and further eastwards until Mongolian Empire. Sandomierz and Zawichost guarded the main ford across the Vistula. The Royal City of Poland from 1038 to 1596. To this day Cracow is regarded as the spiritual and intellectual center of Poland and the emblem of national identity. Cracow is home to many higher schools, including the oldest Jagiellonian University. Lajkonik a symbol of the city. A fellow in oriental dress rides a wooden horse. A traditional parade is held on the Market Square after the Corpus Christi Feast. Wawel Dragon another symbol of Cracow. A legend has it that the dragon used to live in a cave at the foot of the Wawel Hill. Seat of Polish dukes and kings; today the most beautiful museum in Poland. Gothic basilica housing numerous treasures. The Zygmunt Chapel, is a gem of the Renaissance. Above hangs the mighty Zygmunt Bell weighing 8 tons. Cathedral Museum, Wawel. One of the largest squares in Europe, a quadrangle of 4 ha. Laid out in the Middle Ages, the Grand Square has been for centuries the focal point of life in Cracow. A threenave Gothic structure housing one of the largest Gothic altars in Europe, carved in wood by Wit Stwosz. A call is trumpeted every hour from the church’s tower. The first cloth stalls were erected on the Grand Square in the 13th century. Today they house numeous souvenir shops and, on the first floor, the Gallery of Polish Fine Arts from the 19th century. A precious example of medieval defensive architecture. The oldest university building in Poland. Today it is the Museum of the Jagiellonian University – about 2000 historic instruments used in astronomy, some of them from the time of Copernicus, physics, chemistry, cartography, works of art are displayed. Tyniec Benedictine monastery standing on a limestone rock overlooking the Vistula River, with remnants of the oldest structures from the 11th century. Erected in the 15th century, this Gothic synagogue is the oldest Jewish house of worship in Poland. ul. Szeroka 24. A collection of paintings beginning from the 13th century and including the “Lady with an Hermine” by Leonardo da Vinci and the “Landscape with the Good Samaritan” by Rembrandt van Rijk. An armory with a collection of militaria. ul. św. Jana 19. The main building houses a huge collection of Polish contemporary art since the turn of the 19th century, militaries from Middle Ages on, a gallery of handicrafts, oriental artifacts, a collection of clothing and accessories form the 16th century. Japanese Center of Art and Technology, established in 1994 to promote the knowledge of Japan. Cracow’s Main Market Square is the largest medieval urban centre in Europe. The centrally positioned Cloth Hall, a construction from the turn of the 12th century, was originally designed for the cloth trade. The Cloth Hall, topped with gargoyles, acquired its decorative appearance in the 19th century, when arcades were added. Today, the ground floor continues to be a trading centre for crafts and souvenirs, while the upper floor houses the Gallery of 19th Century Polish Painting. Overlooking the square from the east is St Mary’s Church with its magnificent high altar, carved by the Nuremberg sculptor Veit Stoss (known to Poles as Wit Stwosz) and acclaimed as the greatest masterpiece of Gothic art in Poland. Carefully The International Festival of Mountain Folklore in late August is the town’s leading cultural event. In winter Zakopane hosts such sports events as the FIS (Fédération Internationale de Ski) Championship, the New Year’s Run, the Continental Cup, the National Winter Sports Championship and the Student International Sports Championship. Poland’s winter sports capital is also a well known health resort and an important centre of highlanders’ culture. Another historical municipality in the outskirts of Cracow, Kazimierz, is now one of the city’s most attractive districts. Dotted with old buildings which give a special ambience to the area, Kazimierz was home to the larger part of the Jewish population of Cracow till 1939. Here, we find the famous Remuh Synagogue and the Alte Schule, Poland’s oldest synagogue, today an important museum of the district. Worth a visit is also the Templ founded by the local Association of Progressive Jews and the Wolf Popper synagogue. Kazimierz is one of the major sites where historical monuments and artifacts’ of Christian and Jewish cultures are gathered. Here, both ethnic groups settled centuries ago and left their traces which are still visible today. Every year in June/July, a Festival of Jewish Culture is held in the Kazimierz district, attracting hundreds of performers and thousands of spectators from all over the world. Here, in the labyrinth of the narrow streets of Kazimierz, they can travel into the distant world of a fascinating, once-existing culture. Europe's oldest salt mine is located in Wieliczka, where 25 million tones of salt have been mined over the last 1,000 years. The mine is in operation to this day. Due to the therapeutic microclimate, exhausted mine shafts are used as sanitarium facilities today. Conferences and balls are also held in the subterranean chambers. There is even an underground restaurant. Unused excavation sites have also been adapted to house a mining museum with objects dating as far back as the 11th century. The caves and several chapels are decorated with numerous salt sculptures. The most unusual site is a 17th century underground church, within which everything is carved from salt – from the chandeliers to the figure of its patron saint, St. King. Wieliczka at the outskirts of Cracow has been the salt-mining centre since the 13th century. The length of its shafts and tunnels totals 350 kilometres. Besides, there are above 2,000 underground excavating chambers. The salt mine, still in operation, has been included on UNESCO World Cultural Heritage List. The three upper levels out of the overall 9 are open to tourism. The 4.5 kilometre route extends to a depth of 136 metres below the ground, passing 20 chambers and numerous underground lakes on its way. Many chambers are decorated with intricate salt carvings. In the St Kinga’s Chapel where regular concerts are held, there is an altar carved from salt. The mine museum tells about the history of salt mining. A local curiosity is the sanatorium situated 211 metres below the ground where asthma and bronchitis are treated. While in the environs of Wieliczka, it is also worthwhile visiting the castle (Zamek Żupny) dating from the 14th century with a museum, displaying, among other objects, an interesting collection of old saltcellars. Underground town: on several levels at depths ranging from 60 to 100 metres. It includes a sanatorium, post office, cinema, restaurant, souvenir shop and concert halls.